Join the discussion on our forums! Come discuss Elder Longneck over in our dedicated Elder Longneck discussion topic. Beautiful golden animation, but I keep playing this card and it's almost always so terrible and easily removed. Not worth adding to your decks. That golden animation is so smooth. I think this card is going to see a good amount of play. While it's true that Divine Shield and +3 health will be useful more often than most of the Adapt options, there may be times when Stealth is good for making it a 3 mana 5 damage spell, or Taunt allows you to force a favorable trade. Even +3 attack or windfury could be useful in some matches, putting pressure on your opponent to kill it right away or die. Given the Druid quest and beast synergy, I bet we'll see this guy a lot in constructed. 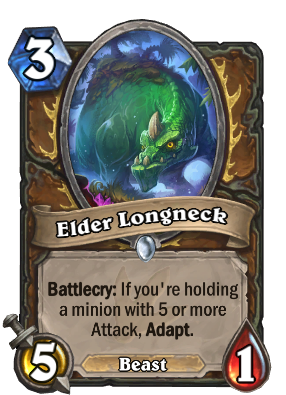 Edit: I totally agree with the sentiment that this should have been Longneck Rager or something similar, officially putting it in the illustrious company of Magma Rager and his 3 mana 5 attack family. If quest is viable, this is auto include, also new card for armor gain synergy and 90% chance to get pretty strong adaptation, a bit underrated card. Yep this is definitely a druid rager. Playable because of quest synergy. God, this card is horrible. It's magma rager with the beast tag that tells your opponent if you have something big in your hand in exchange for a buff that usually doesn't help it much at all. To make sure it doesn't die in the next turn..
Divine Shield - +2 Attack Scarlet Crusader. +3 Health - 5/4 minion.